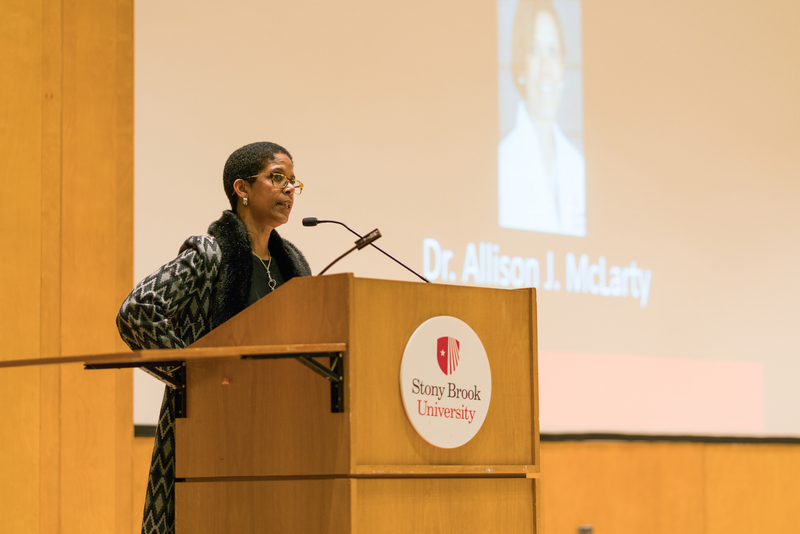 Stony Brook University marked the start of Black History Month on Monday, Jan. 29 with a speech from Dr. Allison J. McLarty, M.D., a cardiothoracic surgeon at Stony Brook University Hospital. “This very moment we can change our lives. There was never a moment, and there will never be a moment, when we are without the power to alter our destiny,” McLarty said to the audience in the Student Activities Center Sidney Gelber Auditorium. Born and raised in Jamaica, McLarty came to the United States to attend Swarthmore College and pursue her dream of becoming a doctor. Before college, McLarty said she had attended all-girls schools and grown up in a predominantly black country, and was thus shielded from gender and racial biases. The first time she truly experienced what it felt like to be a minority was when her college advisor told her that she couldn’t become a doctor because less than one percent of foreign students make it to medical school. After residency, McLarty got a fellowship at Columbia in cardiothoracic surgery. In 1998, she was hired by Stony Brook Medicine and has been there ever since. Early on in her career, McLarty said people who came in for surgery were often “puzzled” and did not believe that she was a surgeon. They often mistook her for a nurse because she was a young black woman. “Patients survived, and the word got out that ‘she is female, she is black, she is young but she is capable,’” she said. Even once she gained the respect of her patients, she still faced skepticism from her colleagues. Eight years ago, McLarty was asked by the department chairman at the time to build a cutting-edge mechanical heart support machine. She succeeded, and in 2010 Stony Brook implanted the first ever left ventricular support system on Long Island. However, after the project was completed, the chairman confessed that he had initially doubted McLarty’s abilities and was expecting her to fail. A previous version of this story misidentified Dr. McLarty as a cardiologist. She is a cardiothoracic surgeon.